Just like your wedding dress, your wedding day hair and makeup has to be flawless, exquisite, and tailored for you! This detail is so important that there is an entire industry of bridal hair and makeup artists in San Diego who have built companies specifically to work with the bride and her attendants on her wedding day. Although booking hair and makeup usually falls lower on the to-do list- long after the dress, venue, photographer and flowers- it is truly one of the very most important services you will be booking for your big day. Your wedding day photographer will capture the cake being cut, the guests dining, a sweet photo of you with your parents and lovely shots of your floral. Of the hundreds of photos your wedding photographer is going to take, more than 80% of them will feature your beautiful face. The heart of the matter is that when the time comes to carefully select which of these photos will be enlarged and printed to hang magnificently on display for years to come, you will choose a photo with your face in it. That is why professional hair and especially makeup is so important to your wedding day- this is what you will see and remember for years to come. Generations of children will be shown these photos, and they will be passed down again and again. Your wedding day photos are more than just a service- they are an heirloom. You’ll want to be radiant in them. As a professional wedding hair and makeup artists with thousands of brides and a decade of experience under my belt, I’ve learned several things about what to do and what not to do to make sure that your look is timeless on the big day. While naturally I will encourage you to seek professional services, this do-and-don’t list can also be a guide for a bride who may not be able to retain them. DO book your San Diego wedding makeup and hair after your venue date and ceremony time is secure. Most reputable hair and makeup companies book out far in advance, and unlike invitations or bridal shoes, the quantity is very limited to how many hours there are in a day. Do NOT have your friend, mom, or aunt who sells Mary Kay or Avon do your makeup. These lines are not camera-ready and while this person may be artistic enough to apply them well, the photographs will be compromised. DO read reviews of makeup in San Diego, look at portfolios, and visit the website of several hair and makeup companies before choosing the company that is the best fit for you. These three things combined will help you determine if you and the company are a good fit. The review system is not perfect, anyone can have a good photographer retouch a photo to make makeup look good, and a decent looking website can be bought under $100. All these factors need to be taken into consideration when choosing your pro. DO NOT opt for hair instead of makeup if you have a limited budget. 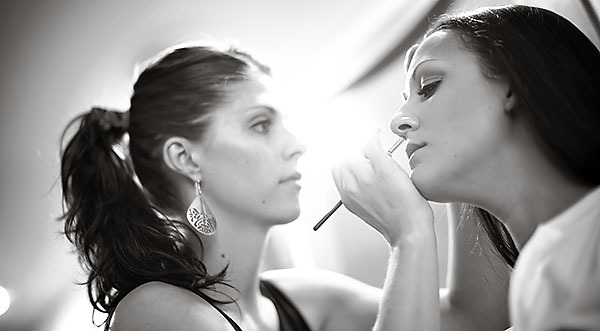 While good wedding hair can often be managed on your own, great photo-friendly makeup cannot. Especially now that many wedding hairstyles are more chic and relaxed then high and structured up-do’s. It also helps to remember the back of your head will be in far fewer photos than your face, and may even be covered by a veil. DO wait till about a month or less from your actual wedding in San Diego, CA to have a trial. While you may want to “audition” makeup artists prior to booking one, a trial booked too far in advance won’t benefit you as much as having it closer to your wedding date will. Your hair and skin condition at that time will be more similar to what you’ll actually have on the wedding day, and with your wardrobe and accessories are already chosen and can be taken into consideration at your trial. DO NOT become fixated on the exact hair and makeup look that you want. Instead, opt for a “mood” with a few similar ideas to go from. The mood of your look is far more important than super-specific details. Also, exactly what you want may not be achievable based on a number of factors, such as your haircut, texture and length, as well as your eye shape and bone structure. It’s far easier to create a beautiful vintage-inspired look than it is to try and force your hair or face to look a way that is against its nature. DO review all the pre-appointment information that your hair and makeup artist sends you prior to your appointment. Not only does this prevent last-minute scrambling to gather things needed, but it also gives you an opportunity to ask any questions that you may have otherwise missed. DO NOT let your bridal party determine what time they feel like showing up to their appointment (and this includes your moms, nina’s, and anyone else receiving services.) Especially for larger wedding parties that start very early, sometimes bridal party members assume that someone else will just go before them. This creates a problem because when several ‘maids assume that, no one is there on time and the whole day starts to run behind. It’s best if at least half, if not all, are there ready-to-go at your designated start time. DO take the time to pull inspirational images for your hair and makeup artist. While using words is sometimes helpful for us to fully understand the look you’re hoping to achieve, it’s true that a picture is worth a thousand words. Equally important, leaving it entirely up to the artist to determine your wedding day look is not a good idea. While the artist may give you a stunning smoky eye and sophisticated up-do, if you don’t wear much makeup and always have your hair down you’re going to feel uncomfortable in your own skin. DO NOT try to micro-manage how the appointment times are set up. Give your hair and makeup artist all the information they request and allow them to determine what time they need to arrive to have everyone’s services completed according to your time line. 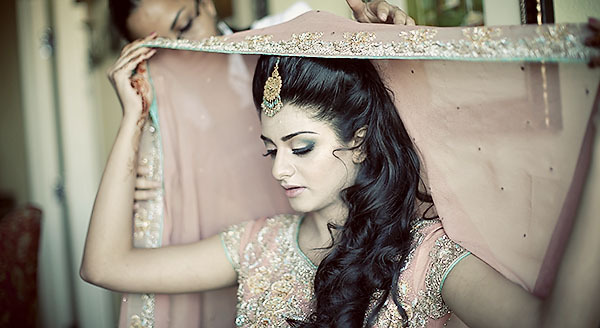 A seasoned wedding hair and makeup artist understands the flow of the wedding day, and by trying to determine this yourself you could either not leave enough time or have so much left over time there’s a significance lull between festivities. DO get any facials or waxing done two weeks or more prior to your appointment. Facials can cause the skin to break out from chemicals that cause your pores to purge. Waxing creates a much exfoliated area, and makeup does not stick well to freshly waxed skin. DO NOT try and force your mom’s into a hairstyle that they really are not comfortable with. It doesn’t happen often, but occasionally we do see brides try to break their mom out of the 80’s with a modern look for the wedding. That’s fine, but the wedding day is not the time to try that. If she hates it, her appointment time may be doubled as the stylist tries to give her the old style back, and that sets everyone’s appointment back. Or, alternatively, your mom will just suffer in silence because she doesn’t want to upset you. You may think a smoother look is beautiful on her, but remember: it’s her big day, too. The most important part of your San Diego wedding day hair and makeup is that you feel stunning, confident, and beautiful for your husband-to-be. The second most important thing is that your wedding day photo’s look flawless, a happy treasure of a special day you’ll be able to pass along to your children, and your children’s children, and their own again after that. Though it’s a relatively small portion of your budget and just the prelude to an amazing day, the right wedding hair and makeup has a big impact on not just the day you take your vows, but for years to come. For more hair & makeup tips and the latest on wedding beauty please visit our blog!!! 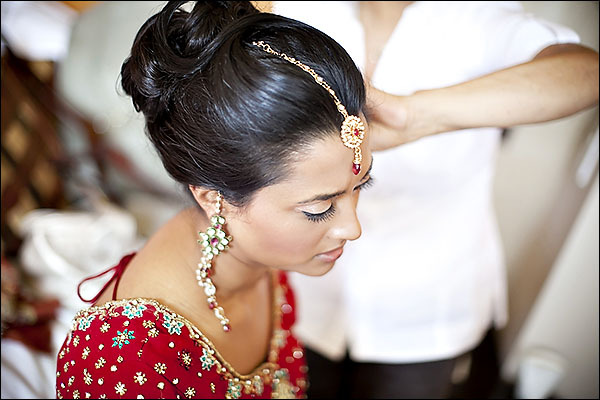 This entry was posted in Amelia C & Co, California, Hair & Makeup, Indian Wedding, San Diego, South Asian Wedding, Wedding.